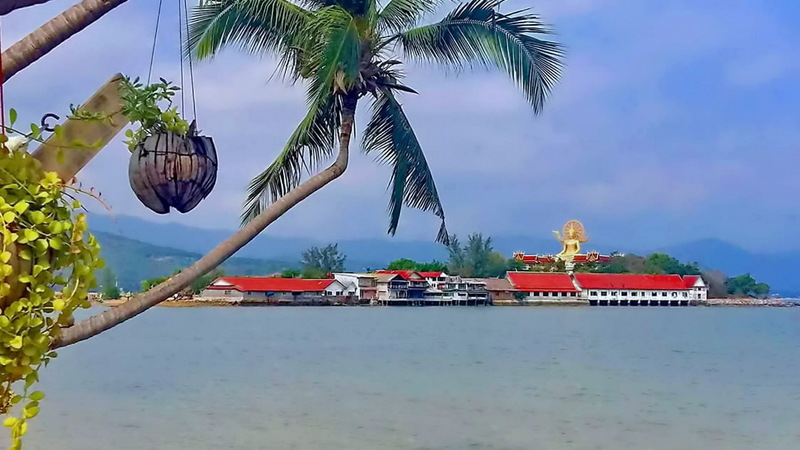 As you approach Koh Samui, either, by plane or boat from the neighbouring Islands of Koh Phangan, Koh Tao or Koh Nang Yuan, you will see this golden coloured, 12 metre high, Buddha Image sitting above the Buddhist monastery on its own small Island, as you near the shores of Bangrak and Big Buddha beaches. Wat Phra Yai and the attached Buddhist monastery, was built in 1972, on a rocky island called Koh Farn, which is part of the temple grounds belonging to the nearby Wat Plai Laem. 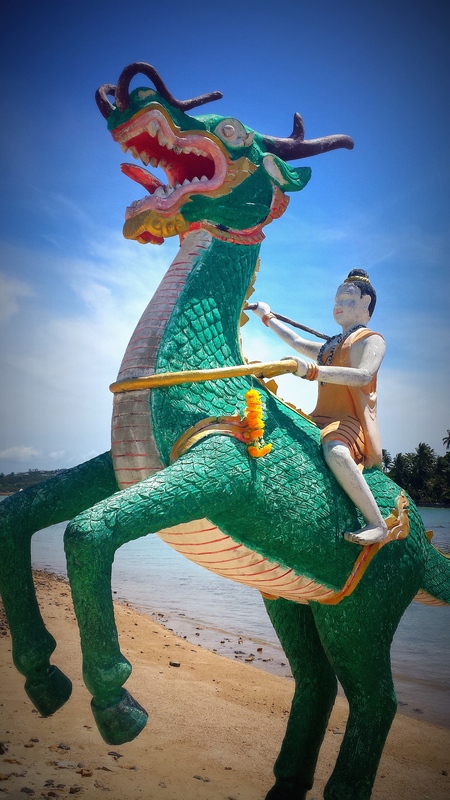 Access to Wat Phra Yai is via a 150 metre man made causeway that links mainland Samui to the temple on Koh Farn. A stairway flanked by the mythological serpent called Naga leads up to the viewing platform, where you can see the huge Buddha image in close detail. 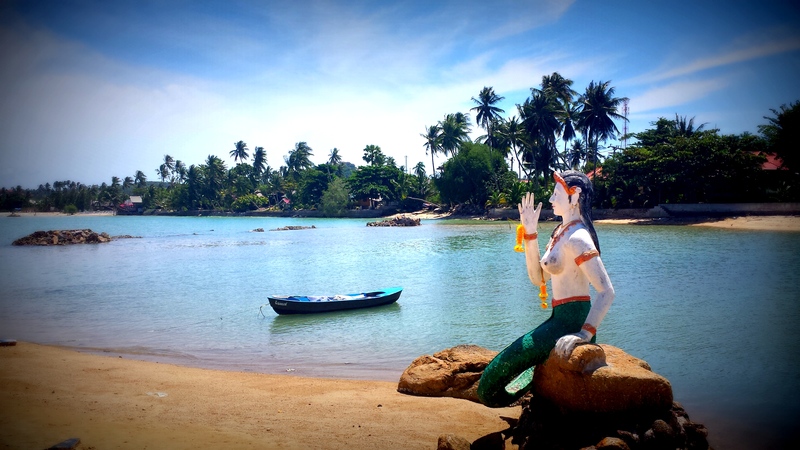 From the platform there are spectacular views of the surrounding beaches and the “Full Moon Party” Island of Koh Phangan to the North. On either side of the stairs there is a pavilion, housing smaller Buddha images. Only a few years ago a Dharma wheel that represents the Buddha’s teachings of the path leading to Enlightenment, was added to the image. The Buddha is in the subduing Mara posture, which symbolises the Buddha not giving in to temptations presented by the Mara, a demon trying to tempt the Buddha with beautiful women. At night the Buddha is lit up by spotlights, giving its silhouette a mystical appearance against the sky. In the early mornings, one can observe monks chanting their morning prayers as well as locals who bring offerings of food, incense and flowers. Be sure to pop into a few of the stalls surrounding the base of the temple during your visit. Local street food, fruit, flowers and fun souvenirs can be found aplenty. merits for themselves and their families. 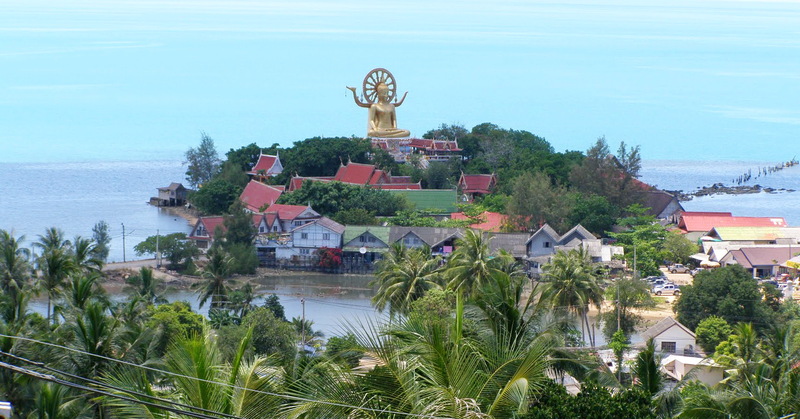 Big Buddha temple sits majestically on a small rocky island off Koh Samui’s north-eastern corner. Known locally as Wat Phra Yai, its golden, 12 metre seated Buddha statue was built in 1972 and remains one of the island’s most popular attractions. 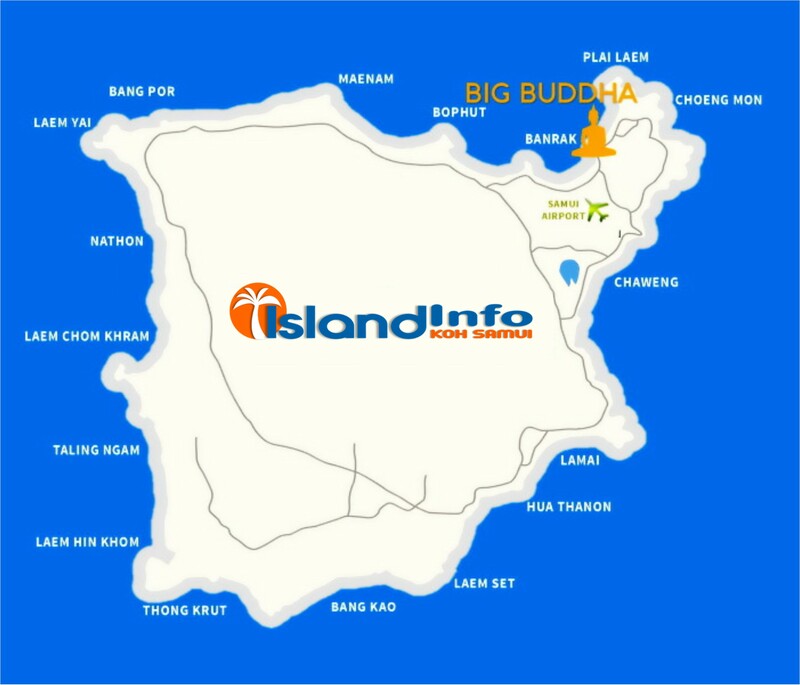 Set on Koh Faan, Big Buddha temple is reached by a causeway that connects it to the main island. The Big Buddha can be seen at a distance of several kilometres and is often the first landmark people see when arriving to Samui by air. The Big Buddha sits in the Mara posture, with the left hand’s palm up resting on the lap and the right hand facing down, the fingers hanging over the knee and grazing the ground. It depicts a time during Buddha’s journey to enlightenment where he successfully subdued the temptations and dangers thrust at him by the devil-figure Mara by meditating and remaining calm. The pose is a symbol of steadfastness, purity and enlightenment. 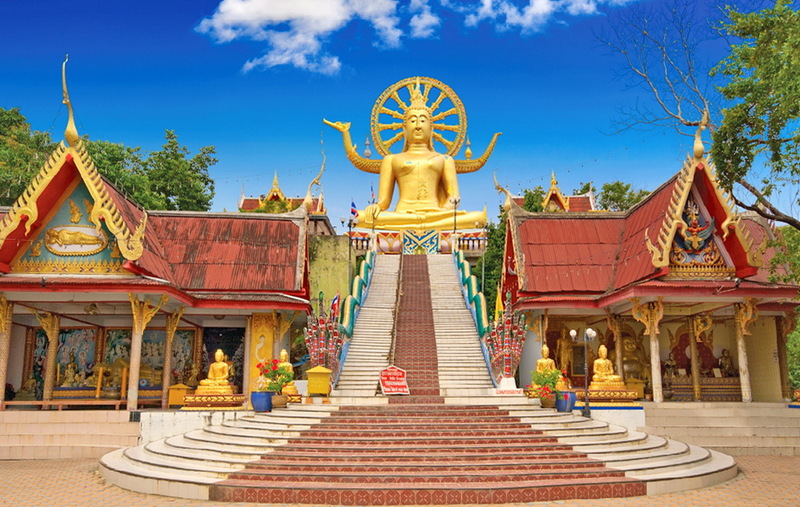 All over Thailand the Wat serves as a major centre for cultural festivals and Big Buddha temple in Samui is no exception. During such festivals as Loy Kratong or Songkran the temple becomes crowded with people making merit and enjoying the entertainment, food and markets set up in celebration. 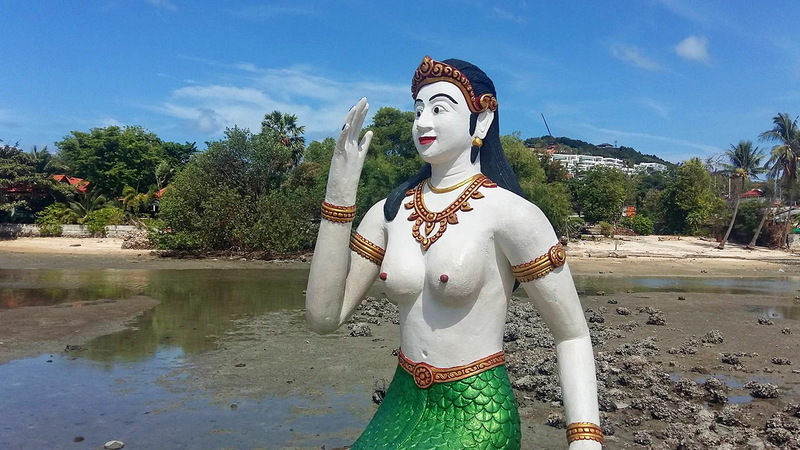 The beach nearby was originally called Bang Rak, but due to the prominence of the temple at its eastern end it is now more commonly known as Big Buddha Beach. There are a number of hotels and guesthouses along its sandy shoreline, and plenty of places to eat and shop. Naga – The snake king. Vestige of pre-Buddhist fertility rituals and protector of the Buddha and the Dhamma. • Nagas are serpent beings from ancient Indian mythology. In early Hindu art, Nagas have human upper torsos but are snakes from the waist down. Travel route 4169 towards the north-east corner of Samui, then turn onto route 4171 and follow until you see the Temple Gates leading to Koh Farn. 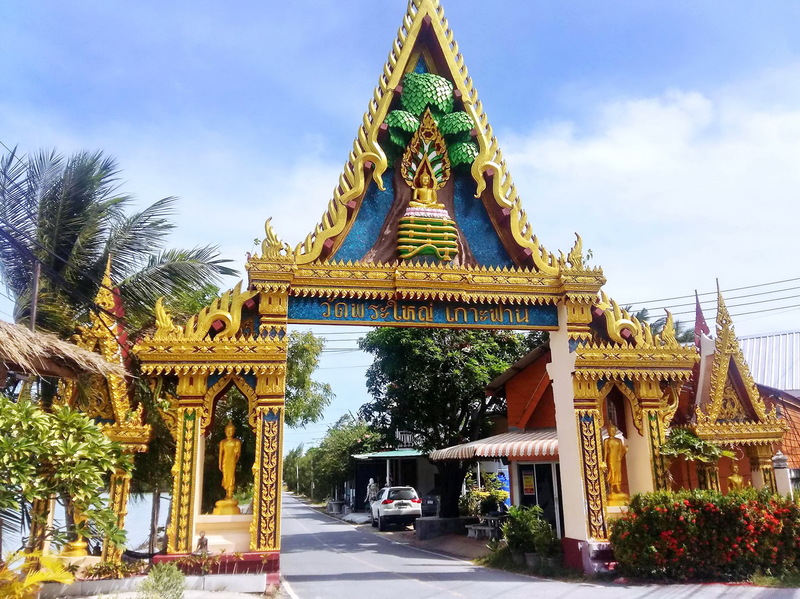 The temple is about 3 kilometres north of Samui International Airport, 3 kilometres east of Bophut Beach and 7.5 kilometres north of Chaweng Beach. The temple grounds are open to visitors all day. To witness a real cultural experience, go in the morning, around 6 to 7 am, and listen to the monks chanting their morning prayers and collect their daily alms and offerings. 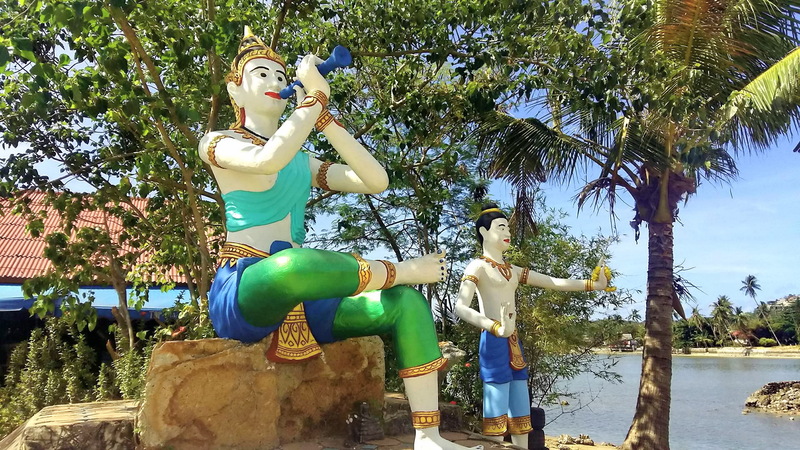 Like many places in Thailand, Koh Samui is blessed with a number of temples, shrines and religious statues that you really should go and visit during your stay on the island. 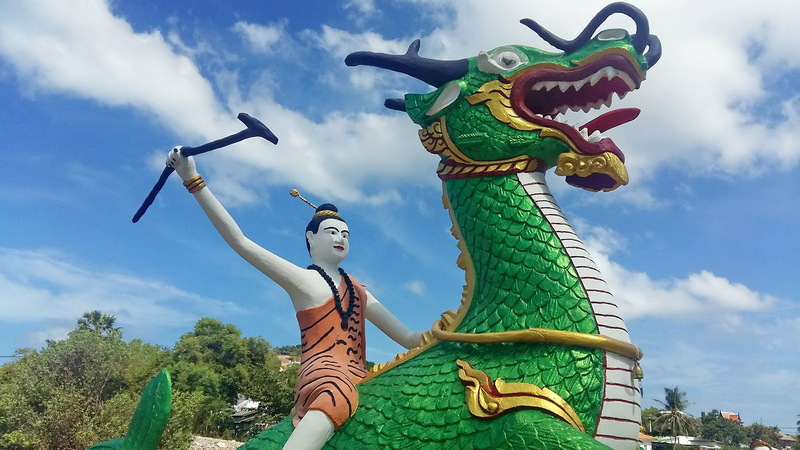 A visit to a Buddhist temple can provide a great insight into Thai culture and local life on Koh Samui. Not only can they provide a great opportunity for sightseeing, temples and shrines can also look great in your holiday snaps and will no doubt be a real point of interest for when you show your friends or upload them onto your favourite social networking site. 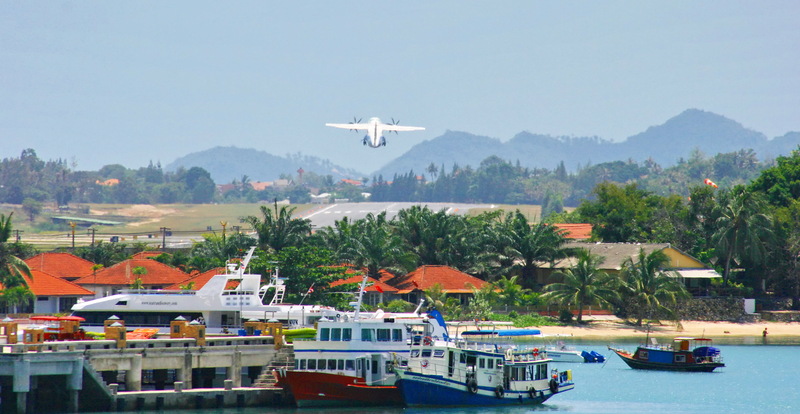 They can also provide a break from the beach and provide you with the opportunity to go and explore the island. Around the base of the Big Buddha statue you will find a number of small souvenir shops that sell a wide range of traditional Thai goods and crafts. There are also a couple of Thai style restaurants, a tattoo artist, a Batik painter and a specialist silversmith. If you do visit a temple or building of religious importance, it is required that you dress appropriately and be respectful of the local culture and expectations at all times. As you enter any temple, you must remove your shoes and in some cases, especially women, you might need to cover your knees and shoulders. You should also avoid raising your voice or do anything that may disrupt the quiet, calm and meditative atmosphere that is present inside the temple. Some temples or religious and historical buildings do not permit the use of cameras, so if you are unsure about taking a photograph always seek permission or approval by asking someone in authority at the temple or building you are visiting. Theravada Buddhism, practised by at least 90% of Thais, was introduced from India around 300 BC. • However, Thai practice incorporates many Hindu, Tantric, and Mahayana Buddhist influences. The worship of Buddha images, for instance, is a Mahayana Buddhist practice. • Animist beliefs in spirits and the magical and in astrology are also widespread. • Thais believe that Buddhism is one of three forces that give their kingdom its strength, the other two being the monarchy and nationhood. • Religious rituals colour daily life, especially in the form of merit-making. 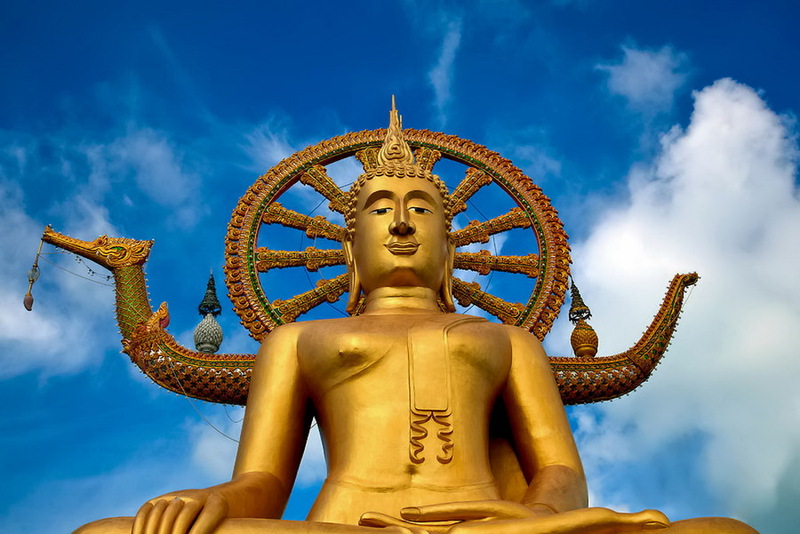 Freedom of religion is guaranteed in the constitution, which was modified in 1998 to loosen ties between the state and Buddhism and increase harmony among religious communities.